UPDATE: Silver notes that Democrats could be underestimating the seriousness of these sexual harassment charges lobbed against Franken. Yes, the Moore allegations are a LOT more serious. But that isn't necessarily all that relevant, because both the Moore and the Franken allegations may rise to the threshold of "firing offense" for voters. Senate Majority Leader Mitch McConnell, a Republican, repeated a statement from Thursday calling for an ethics investigation of Franken. After publicly denouncing Franken’s conduct and supporting that investigation last week, no powerful Democrats had spoken out by Monday afternoon about Menz’s allegations. Menz, 33, who now lives in Frisco, Texas, said her father’s business was sponsoring a radio booth at the Minnesota fair and that she took photos with several elected officials and political candidates as they stopped at the booth. I thought the Democrats had an opportunity to maintain the moral high ground without having to pay a political price for it. They could keep the pressure up on Moore, who has put Republicans in a no-win situation in Alabama. And they could help to establish a precedent wherein severe instances of sexual harassment warrant resignation. In the long run, that might create more of a problem for Republicans than for Democrats, because the overwhelming majority of sexual harassment is conducted by men, and there are 265 Republican men in Congress compared with 164 Democratic ones. Almost all of these comments said that sexual harassment must be taken very, very seriously. But the remedy they propose for Franken — referring the allegations to the Senate ethics committee, a step that Republican leader Mitch McConnell, White House press secretary Sarah Huckabee Sanders and Franken himself have also called for — isn’t particularly serious. Unless, that is, the committee process led to Franken’s expulsion. But there have been many ethics investigations and very few expulsions — none since 1862 — and none of the statements made by Schumer or the other leaders raised the possibility of expulsion. Moreover, it’s not quite clear what behavior the ethics committee would actually be investigating: Franken hasn’t really denied Tweeden’s claim that he kissed her without her consent, and there’s already photographic evidence that appears to show he groped her. It’s possible the investigation could turn up evidence of similar incidents involving Franken and other women. But if Franken is a repeat offender — as so many sexual harassers are — that’s all the more reason for Democrats to want him out of office now instead of dragging the party through the mud. Of course, what might be politically expedient for Democrats isn’t necessarily expedient for Schumer — or for McConnell, or for the White House, all of whom may be acting out of a sense of institutional self-preservation. If there’s a precedent that sexual harassment is grounds for removal or resignation from office, then a lot of members of Congress — including some of Schumer’s colleagues and friends — could have to resign once more allegations come to light, as they almost certainly will. It’s a sad commentary. It’s a rather uncontroversial point that the creeps have to go, but we have a mixture of circling the wagons and victim shaming occurring. It seems ironically that the default Democratic position in these situations is to hunker down, just like in the Clinton era, which some feminists and liberals are beginning to see as a colossal lapse in moral judgment on their part. Then again, we’re seeing a replay of this movie. We have the media playing up the apology, how he was a comedian, he wasn’t in Congress etc. how is that exculpatory? 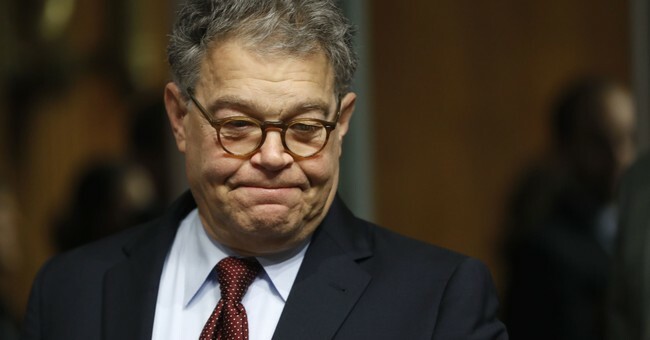 First of all, Franken wasn’t just some comedian, as Mediaite’s Larry O’Connor pointed out he was a well-known radio host and activist when the Tweeden incident occurred. Don’t get me wrong, there’s zero room for a defense of Roy Moore either. His behavior since the allegations were thrown his way has done little if anything to dispel their veracity. Attorney General Jeff Sessions even said that he has “no reason to doubt” Moore’s alleged victims. For those who are shocked, well—this is Congress. It’s mostly a pit of snakes. There are no good guys, or at least in the battles we’re talking about. Hillary Clinton and the Democrats can’t really direct heat on Trump, which is what they’re lusting for, because some on the Left are admitting that Bill’s accusers were treated horrifically, and that the former president should have resigned after the Lewinsky fiasco. The Clintons aren't exactly a role model either in this department. There was no accountability with Bill; that’s why when Hillary talks about it, it’s total crap. With the GOP, we’re just stuck with Moore. The only reason to vote for him is because he’s a Republican. If you can do that, power to you—I don’t think many can stomach a significantly older man trying to grab dates with girls who have barely finished their freshman year of high school. It’s just inexcusable. The whole issue is inexcusable, but it’s the Left that’s drowning miserably as they try to save a narrative. The ‘War on Women’ line of attack from Democrats really didn’t age well, did it fellas?